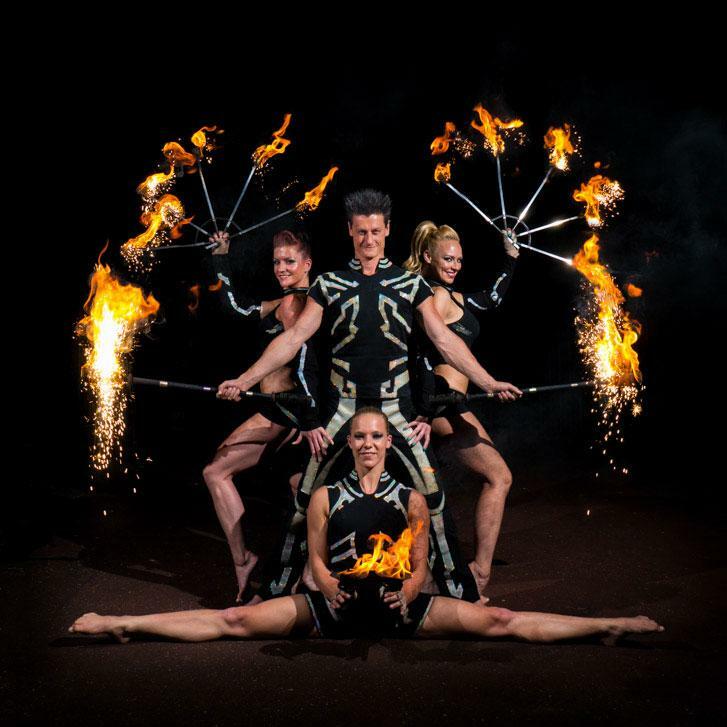 Former Cirque du Soleil artists presenting breathtaking special effects, high impact modern fire dance and acrobatics in a dynamic and powerful act.These corporate entertainers will wow your guests with their stunning fire performances. 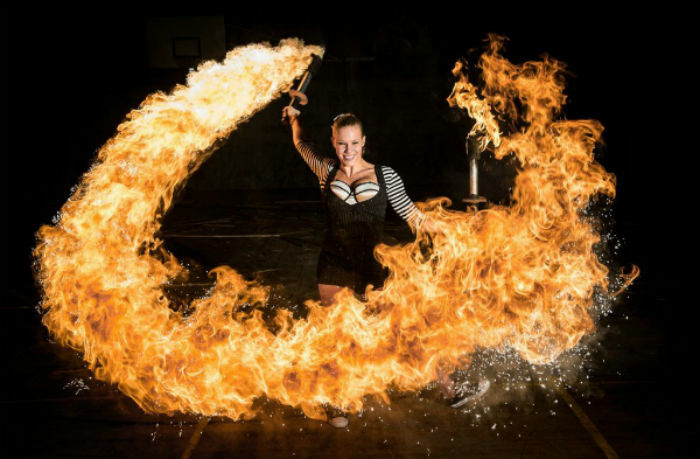 If you want to book a mesmerising stage act for your corporate event, we can’t recommend them highly enough! 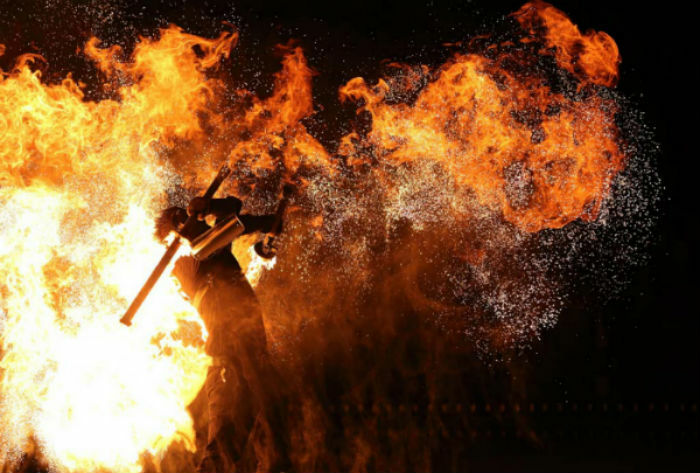 Theatrical and dramatic fire palms dance breaking into fast, energetic spectacular fire skills. 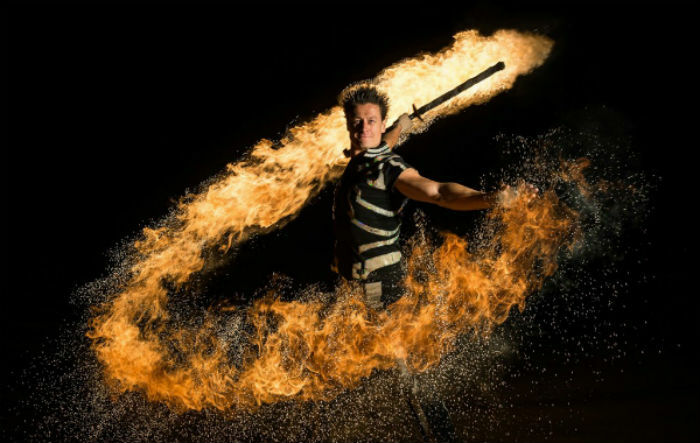 Featuring their unique ‘Dragon Fire’ and ‘Sparkle Fire’ effects with fire swords, double staffs, fire daggers, fire fans, handstands and acrobatics. 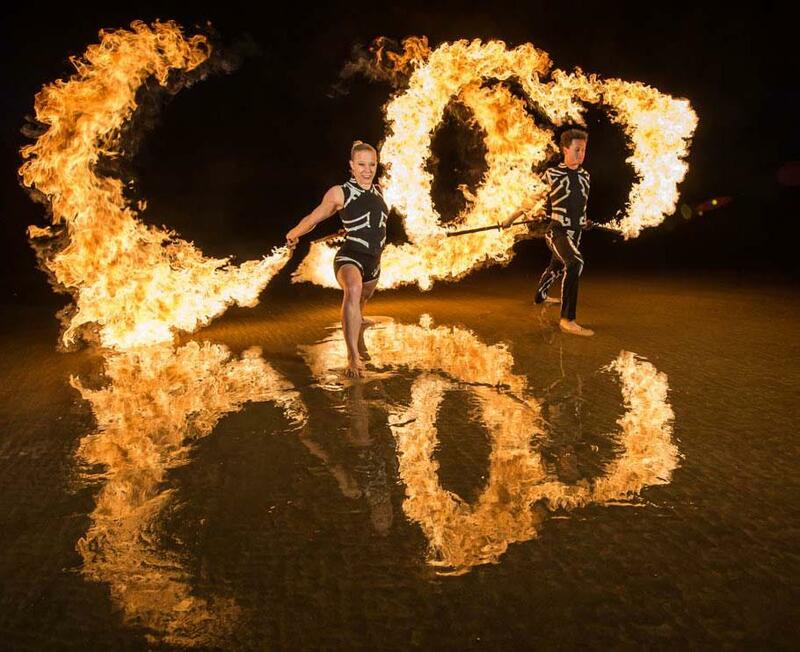 A high calibre feature stage act designed for indoor or outdoor events using specialised non toxic fuels, smoke and odour free with special effects which can be tailored to suit the available space. The show is available as 2, 3 or 4 person show and it can also feature an optional spectacular pyrotechnic finale with a range of effect sizes. 15 years of performing internationally, more than 100 cities in 45 countries across the world including bespoke productions such as the MTV European Music Awards, Goodwood’s ‘Festival of Speed’, TV appearances for BBC, ITV, Chinas CCTV, SMG Dragon TV and competing on Frances TF1 ‘Le Meillure Artiste’ to much acclaim. High magnitude events, productions and long term contracts with Cirque du Soleil, Franco Dragone, Art on Ice, Carre Swiss Christmas, Madinat Jumeirah, MGM, Wynn and Venetian Macau Casinos plus the prestigious Cannes Film Festival. Bespoke requests for outdoor, roving, meet and greet or large scale productions welcome. May I please ask you to pass a huge thank you from me and the rest of the team in T.A Cook to Stephanie and Dan for making the evening such a success. Their performance was absolutely fabulous. And they really made my life so easy leading up to the event by preparing risk assessments in German and providing us with all necessary information. I was very impressed with their professionalism dealing with the fire safety officer on site. Thanks again and I really hope to work with you on our future events. I really appreciate your professionalism and the passion you put into showing and teaching our artists your skills. I was taken aback by the skill level you’re bringing to the stage. 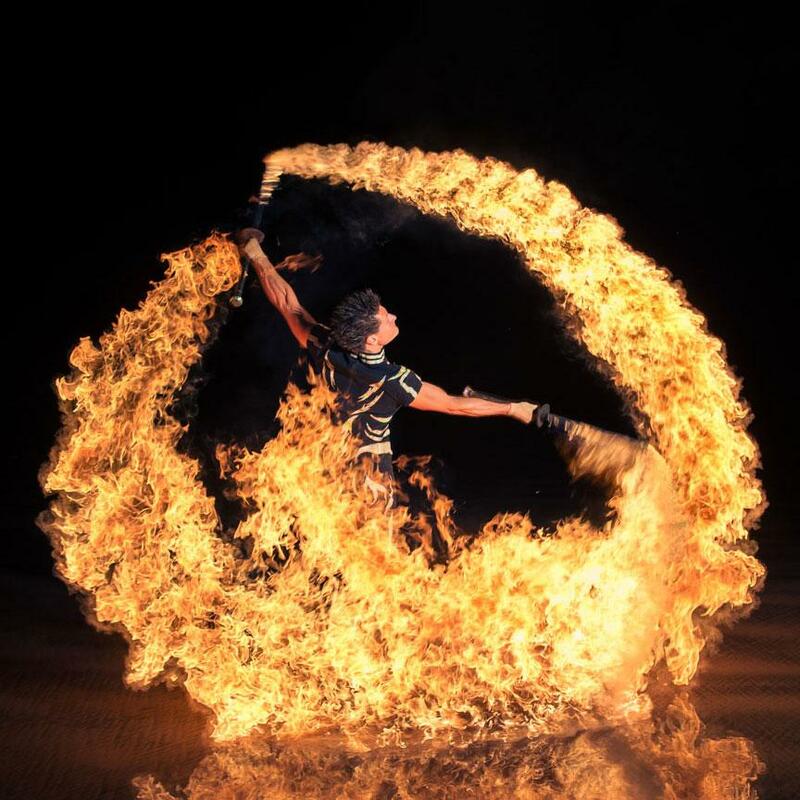 Not only stunning fire skills, but also great acrobatics and dance! Congratulations! The duo from Spark Fire Dance were fantastic! Just the two of them filled our huge stage and kept our 5000 attendees on the edge of their seats. I honestly can’t put into words quite how amazing it was, it was everything I hoped it would be and more. Thank you, it was magnificent. I was right next to President Aliyev and we could feel the flames! We’ll have you back next year.